On Saturday the 26th of October the mighty Brighton Rockers face arguably the biggest challenge in their history. 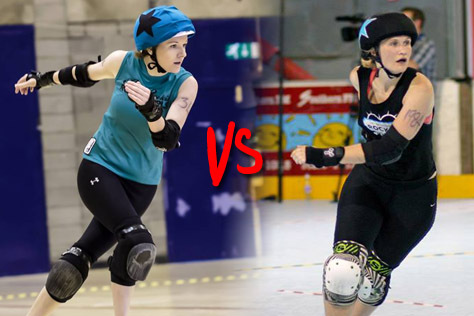 They’ll be taking on the multiple award winning and majorly feared Auld Reekie Roller Girls on the latter’s own well defended Edinburgh turf [for turf read polished wood]. The Scottish side hold first place in the recently released (first ever) official UK Roller Derby Association quarterly rankings. Brighton place seventh, but go into the bout on a high having last month beaten third place Leeds Roller Dolls in Haywards Heath. Tickets, priced at a super reasonable £5.95 (including booking fee) and free for under-14s are available from the link below. Recommending air travel may not please the environmental lobby, but it works out cheaper than the train. The latter is £127 from London (plus whatever it costs to get to the capital) and takes going on for five hours, six plus from Sussex. Depending on what days and times you plan to travel, at the time of writing you can fly return from Gatwick starting at around £100 on Easyjet with British Airways a tenner or so more. We heartily recommend BA by the way, as it’s one of the few airlines in the world still offering unlimited free booze on domestic economy flights. [Psst, sit near the front so you get served first; it’s only a short flight and six double vodka and cokes each is the best we’ve managed, but that more than covers the price differential over Easyjet.] Skyscanner is the best bet for comparing flight prices. Hotel-wise, Trip Advisor remains the go-to place for comparing the various booking websites (booking.com, hotel.com, lastminute, expedia, etc) and their few pence of price difference. As you’d expect for such a hugely popular tourist destination, the central area – Old Town, New Town, Haymarket – is pretty pricey, around £100 a night being standard. Edinburgh’s not a huge place though, being about twice the size of Brighton & Hove, so even the suburbs rarely put you more than 20-30 minutes bus/drive away from the centre. You can pick up rooms in B&Bs from about £40 in the suburbs. There are also a number of centrally located dorm-room hostels. Can’t afford to travel up? Can’t get the time off work? Doing something else that Saturday? Whilst excuses for not travelling all the way up to Edinburgh to cheer on the Rockers may be acceptable, there’s no excuse for not doing the next best thing. The Sunday beforehand (20th October) the Rockers host a pub quiz at Brighton’s Cornerstone, a derby friendly pub at the bottom of Lewes Road and Elm Grove. It’s £3 entry with a maximum five in a team, there’s a school night friendly 6pm start, and all proceeds go towards the Rockers’ Edinburgh travel fund. 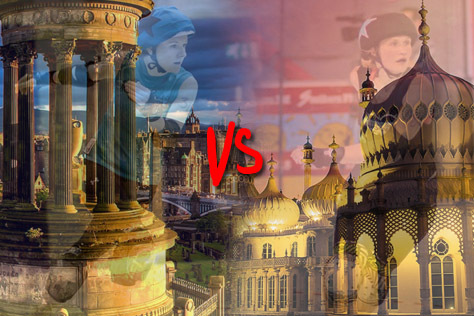 So while you’re waiting for Brighton’s next bout on home wood (against Central City on November 23rd), get your thinking caps on and take on your favourite skaters in a quiz. See the link for details. Can you give us a summary of ARRG’s history and achievements to date, and your future plans? We’ve been together since April 2008 and recently celebrated our fifth birthday. In those years we’ve grown from a group of women meeting up to talk about derby into a full WFTDA member league with over 80 members. We have two travel teams: The Twisted Thistles and The Cannon Belles; three home teams: The Leithal Weapons, Cherry Bombers and The Skatefast Club, and a stellar referee and NSO crew. We’re currently first in the UKRDA rankings and after the Brighton bout, and our School of ARRG Knocks 2 bootcamp on 23rd Nov, we’ll be refocusing and looking at our plans for next year and beyond. Any particular Brighton players you’re wary of? Any ARRG players/tactics to look out for? We saw Brighton play and fight hard against our neighbouring league Glasgow Roller Derby earlier on this year so we know there are some fantastic skaters to look out for. Someone told us that our skater Unprotected Bex looks like one of the Brighton skaters too. Everyone at ARRG is awesome so we’ll let you pick your favourites. As for our tactics we work hard to be focussed on track, work as a unit and work with a hive mind. What kind of after party can we expect? Sorry, the exact details of the after party will be kept under wraps until nearer the time. Rest assured we love to Party ARRG, we recently had a very exciting dancefest with LRG after their bootcamp up here so maybe we’ll recreate that vibe. It would be best to bring your dancing shoes and be prepared for ‘taps oan’ or ‘taps aff’ as we say in Scotland. For any travelling fans making a weekend of it, do you have any suggestions for other things to see and do? Obviously there is the usual touristy things like The Edinburgh Castle, wandering down The Royal Mile, ghost tours, bus tours, lots of free museums and galleries, The Edinburgh Dungeons… the list goes on. As for pubs and clubs, let’s just say Irn Bru is good for treating hangovers! For any ARRG fans reading this who might not be aware of the Rockers’ history to date, can you give us a quick summary? We’ve been around for four years in February, bouting for almost three. In that time we’ve gone from undefeated to badly beaten to doing OK. So fingers crossed we’re now on a steady rise. Any Brighton players or tactics people should particularly keep any eye out for at the bout? I would be killed for sharing any of our TOP SECRET tactics but the usual Rockers stars will be there to cheer on, such as The Mighty Mighty Bash, Rose Bleed, Shambolic and Chariot Sophia. What do you know of ARRG? That they’re awesome. Any particular players in their ranks you’re wary of? Admiral Attackbar 11:11 – great jammer, great leggings! The first official UKRDA rankings recently came out and Auld Reekie are ranked first in the country. Does that make you extra eager to get one over on them? Hmmm… a little. We always aim to play well and have fun. Then we’ll leave happy. Brighton are ranked seventh in the UKRDA table, but you recently beat third place Leeds. What lessons/experience are you taking from that bout into the Auld Reekie one? Never go into a bout assuming anything – in the case of Leeds that we would lose. Always play our best, always wear black! Are you looking forward to seeing Edinburgh in general. Any touristy plans, or are you too focused on the bout for anything else? The after party is always something we look forward to and lots of Rockers are hanging around for a day or two after to see the sights. What other events do the Rockers have coming up this year and beyond? Our next home game is against Central City on the 23rd November – early bird tickets are on sale now – and we’re looking to have a few European guests next year. Oh and there’s a pre-ARRG pub quiz on 20th October – details are on our Facebook page. This entry was tagged Auld Reekie Roller Girls, awesomeness, Brighton Rockers, Edinburgh, Leeds Roller Dolls, London Rockin Rollers, roller derby, roller skating, sport, UKRDA, women's sport.